Most people love to eat at the fair. So many unusual options, all heavy in the grease and fat. 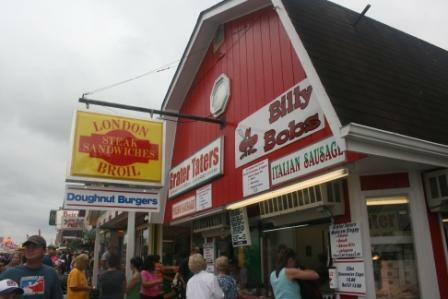 Things like fried oreos and fried candy bars abound. But doughnut burgers? That was a new one. I'd gone to this place to get Grater Taters for lunch, which I figured would be good for sharing - even the twins could eat some fried potatoes. I said, "Eewwww, gross, doughnut burgers?" Paul immediately had to have one. I mean, no one would really eat a doughnut burger, right? Just looking at this picture turns my stomach. 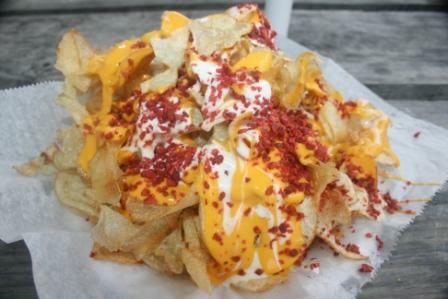 Meanwhile, I got the grater taters, loaded, which means they had ranch, nacho cheese, and bacon bits. The first two bites were good, but it was all downhill after that. I couldn't eat again for 8 hours. That's an epic long time for me, the runner, the all day grazer. 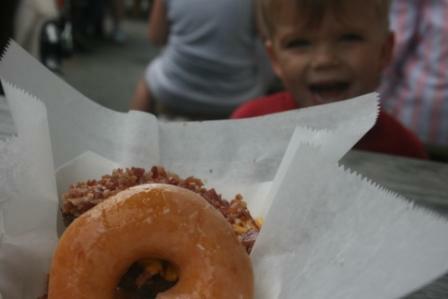 I'll be glad if I don't see any more fair food for about 10 years or so! And next time I'm opting for the corn on the cob! what did paul think of his burger? For the record I actually liked the donut burger! Salty and sweet all in one package. Make sure you order it 'Messy' with cheese and bacon bits. I'm glad I opted to not add condiments like katchup and mustard because that would have ruined it. Hey I know! Maybe Dunkin Donuts should start offering bacon bit sprinkles on their glazed donuts and see how they do. Wow! Doughnut burger. That doesn't even sound good or look good. They come up with some nasty stuff at the fairs. Ugh... there goes my appetite for lunch. Looks like something my husband would want to try, too. 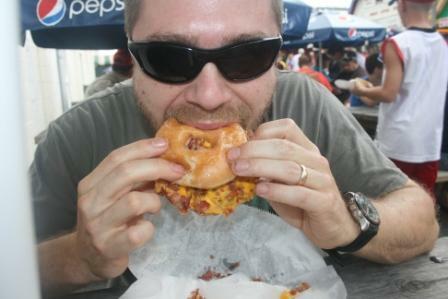 I know that Man vs. Food had one from a stadium (made with Krispy Kremes). I actually made a breakfast sandwich with one; ham, egg and pepperjack cheese. Was good and also my last meat and dairy eating weekend, so I was making it count - lol. Oh my gosh, I've read about these in the news! They look SO disgusting. I'm curious what he thought of them! wow, thats an interesting burger! I couldnt do it, did he like it? Hey, thanks for entering my giveaway, you won! Contact me with your mailing address!!! Thanks for visiting the Old School. It's my first time on Mom Loop. and I followed you so now you are 100! Yay!